Home » News » Cyclone Idai: "the victims personify why we need to act"
A month after the passage of cyclone Idai, hundreds of thousands of people still live in total poverty, with no roof above their heads, no access to drinkable water or electricity, and faced with a cholera epidemic. On March 14th cyclone Idai hit the port city of Beira, the one but largest city of Mozambique, counting roughly half a million inhabitants. Heavy rainfall and strong winds caused enormous destruction and flooding, not only in Mozambique, but also in neighboring countries Zimbabwe and Malawi. The latest reports show nearly 1,000 deaths and three million affected people. This image was taken by the Sentinel 1 satellite on March 19th 2019. It shows in red the extent of the flooding around the Mozambican port city of Beira after the passage of cyclone Idai. Graça Machel, Nelson Mandela's widow and former minister of Culture and Education of Mozambique in an interview for Le Monde, March 28, 2019. The devastating impact of the cyclone and the extent of the damage in Mozambique were exacerbated by the alarming deforestation rate and unbridled urbanisation in the country. Since 1980, 370,000 km² have been destroyed according to the World Bank, an area larger than Germany. The disaster is a terrible illustration of the vulnerability of cities such as Beira that are low-lying, developing rapidly on a coastline exposed to storm tides and already feeling the effects of sea level rise. At the request of Mozambique, the EU Civil Protection Mechanism was activated to aid those affected by the devastating effects of Hurricane Idai. 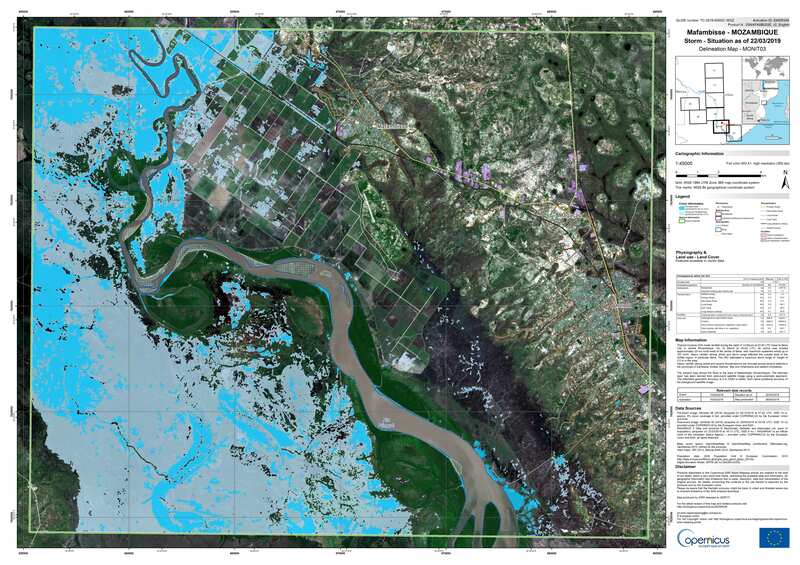 Map showing the extent of the floods (in blue) on 20/03/2019 in Mafambisse, a city to the North-West of Beira that was directly in the path of the cyclone. The map was created by overlaying a Sentinel 1B image from 20/03/2019, supplemented with Radarsat-2 data, over a Sentinel-2B image from 2018. Apart from interventions in the field and the delivery of essential resources such as food, tents and hygiene kits, the satellite mapping services of the European Copernicus Programme are used to aid local authorities working in the field. Since the activation of the Rapid Mapping module of Copernicus EMS (Emergency Management Service) for the three countries, 36 delimitation maps, 14 damage estimation maps and 9 reference maps have been produced already. The Copernicus EMS cooperates with the International Space & Major Disasters Charter for the activations over Mozambique and Zimbabwe.